One of the best ways to enjoy the outdoors is with an outdoor fireplace or grill. 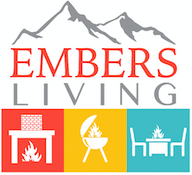 Turn to Embers Living for your outdoor wood burning BBQ grills. We carry top brands like Grand Canyon Outdoor and Superior and have grills and fireplaces in many different sizes and styles for you to choose from. Our grills and fireplaces can be the perfect gift or purchase to help you get the most of outdoor living. So start shopping with Embers Living online today!